What are miniature figures for? Miniature figures have three primary uses: tabletop wargaming, markers for role-playing games, and display. Although there are exceptions, tabletop wargaming minis are usually painted to a basic standard of quality, where the painter wants to churn out a whole army with a common color scheme in a short amount of time. Tabletop wargamers, like players of Warhammer 40K, stage mock battles according to a strict set of rules. 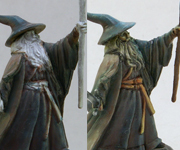 Minis painted for role-playing, like those used by players of Dungeons and Dragons, can vary wildly in style, technique, and quality, depending on the needs and wants of the players, and how much time (and/or money) they're willing to spend. Display models, whether individual pieces, or complex dioramas, are typically very high-quality. Professionally-painted minis can sell for hundreds of dollars. How do you paint something so small? Do you use a magnifying glass? 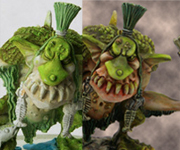 While some painters do, most (including myself) use only our eyes and small, high-quality natural hair paint brushes with hobby paints specifically made for painting miniatures. Very good lighting is important, though. I have a small LED lamp that I use. And Ott Lite is a very popular brand of lamp used by many other painters. What are minis made of? Most miniatures are made of white metal (tin/lead alloy), pewter (tin/lead/copper/antimony alloy), or lead-free pewter. Another popular material is resin (mostly polyurethane). Recently, mini manufactures have expanded into plastic (polyethylene or hard polystyrene). Just how small are they? What scales do they come in? 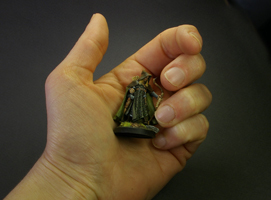 This is a photograph of a 28mm miniature in my hand. Where do you buy miniature figures? You can pick up a wide range of miniature figures at your local gaming store, or order them online. There are many, many manufacturers of miniature figures. Most of the ones in my gallery are from Reaper, but I also really like Dark Sword, and Games Workshop is very popular. Reaper miniatures can be purchased at discount from Miniature-Giant.com. Do you use special paints? The vast majority prefer water-soluble acrylic paints. You can buy low-grade hobby paint at any craft store, but when painting at such a small scale, most artist prefer paints specifically made for the job. The biggest manufacturers are Games Workshop (Citadel paint), Reaper (Master Series Paint), and Vallejo. I like Reaper MSP the best, but GW makes the best metallic paint, so I own some of each. What other painting supplies do you need besides paint? You also need a palette of some kind. You can make a wet palette cheaply from any sealable plastic container, a sponge (or paper towel), and a sheet of parchment paper. I bought myself a Winsor & Newton wet pallete, mostly because of the large palette surface it provides. The palette keeps my paints wet for weeks, with the addition of just a little water each time I open it to paint. I don't do any miniature sculpting (I tried, and I'm terrible at it!). 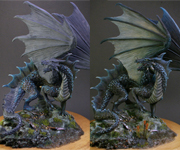 Minis are usually sculpted from a two-part epoxy putty. The most common of these is called green stuff because half of the epoxy is blue, the other yellow, and it turns green when mixed together. I use green stuff to fill gaps between joints on assembled minis, or to sculpt simple conversions, or custom bases. Whether it’s a dedicated area or your kitchen table, make yourself a space where you can work comfortably. Good lighting is essential, and it helps to have all your needed tools and supplies are on hand before you start. I also recommend giving yourself enough time to get truly immersed. Start out with a basic set of paints, brushes, etc., but try out different brands, supplies, and tools. Don’t just use what “everyone” says is the best, or what the "best painters" use. Different people have different experiences with different products, tools, and formulas, depending on their climate, budget, time, and ability. Find what works for you. Look at others’ work, both online and in person. Don’t be ashamed of copying something you see that you want to learn how to do. We all steal ideas from each other constantly. And don’t just paint minis for utility. Sure, there will be times when you need to paint something for a game, for a competition, for a commission even, that you don’t really like, but to maintain your interest, you need to paint figures that truly inspire your creativity, so make sure you make the time for that or you’ll burn out. Seek out and join local painting groups and online communities. Show your work for critique. Ask lots of questions, and when you’ve learned something, share it with others. This is the most important thing to remember as you get into the miniature painting hobby. There are endless tutorials out there on how to do this or that. There are professional painters who create truly masterful work, who share their way of doing things. Try all of them, then keep them or reject them, or mutate them into your own style and your own technique. There is not one right or wrong way to paint. Find your own way – whatever gives you beautiful results, or allows you to best enjoy the hobby. If you don’t, then mini painting will be frustrating and unfun.